Eoghan Clifford will be hoping for a third medal at this year’s Games. Eoghan Clifford will be hoping for more success today. With a gold, silver and bronze between them already, Eoghan Clifford and Colin Lynch seek more success today when the men’s C1-C3 Road Race gets under way at 1.30pm. Given their performances so far, few would bet against them. Speaking of medallists, Ellen Keane has already made a splash at this year’s Games reaching two finals and winning a bronze medal. She’s back in the pool at 1.52pm to take part in the S9 100m Backstroke heats. 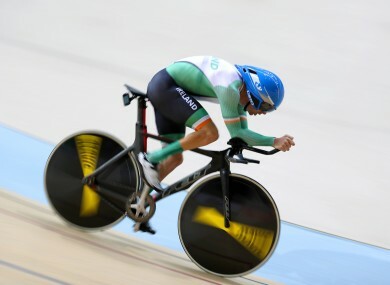 The action returns to the road at 3pm when the Irish tandem of Damien Vereker and Séan Hahessy go in the Cycling B Road Race while John Twomey, Ian Costello and Austin O’Carroll have races nine and 10 of the Sonar Sailing at 5.30pm. Helen Kearney takes part in the Dressage 1A Freestyle Championship at 6.10pm and that’s all the action from an Irish point of view unless Ellen Keane makes her final. That gets under way at 9.52pm. American swimmers Cortney Jordan and McKenzie Coan are not used to competing against each other in the 100m freestyle S7. Jordan won silver in both 2008 and 2012 and will hope to grab gold this time around. However, Coan was reclassified earlier this year from the S8 category and is now the fastest in the world so she’ll have her work cut out. American David Blair was 39 before he realised last year that the club foot he’d had since birth made him eligible for Paralympics. A handy discus thrower, Blair took silver in the 2015 World Championships and will look to go one better in Rio in the F44 category. Email “Paralympic Breakfast: Cycling medalists back for another shot at glory”. Feedback on “Paralympic Breakfast: Cycling medalists back for another shot at glory”.